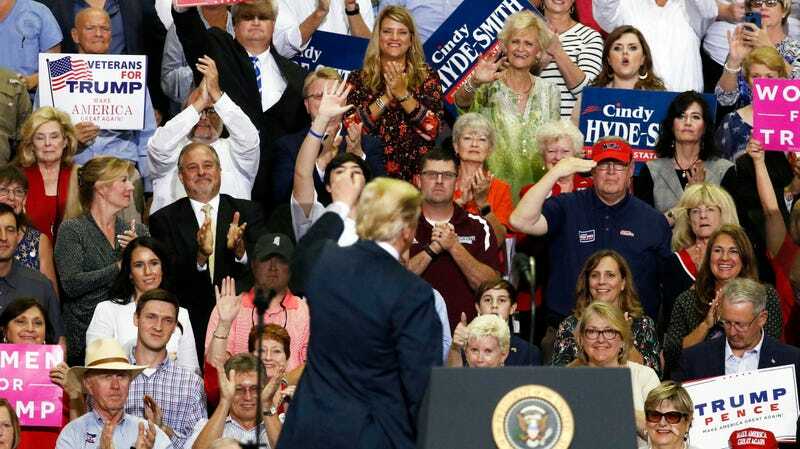 President Trump managed to reach a new low during a campaign rally in Mississippi Tuesday night, where he openly mocked Christine Blasey Ford, who says Supreme Court nominee Brett Kavanaugh sexually assaulted her when she was 15 and he was 17. Trump expressed the kind of crude skepticism and misogynist resentment about Ford that had previously been left to Fox News hosts and your very worst uncle (and also Donald Trump while talking about other women). He mischaracterized Ford’s testimony about the alleged assault and was incredulous toward her claim that she only had one beer. In response, the crowd cheered enthusiastically and women raised their “Women for Trump” signs above their heads. I had one beer! I had one beer. Well, you think it was—? Nope—one beer! How did you get home? I don’t remember. How’d you get there? I don’t remember. Where is the place? I don’t remember. How many years ago was it? I don’t know. I don’t know. I don’t know! I don’t know! The crowd laughed and applauded. Trump continued. What neighborhood was it in? I don’t know. Where’s the house? I don’t know. Upstairs, downstairs, where was it? I don’t know, but I had one beer. That’s the only thing I remember. Politicians have also come out to denounce Trump’s statement, from senate hopeful Beto O’Rourke to New York City mayor Bill DeBlasio.